This is our main laundry room design page where you can access our many laundry room design galleries. 13. Save Space or Go Big? Large white laundry room with custom cabinetry and sink. White subway tile backsplash. Designed by chango & co.
Large modern style laundry room with loads of storage, counter space, cabinets and a sink on laminate floor. Massive laundry and utility room with island, cabinetry and shelving. See this home (amazing). Modern dark gray and white small laundry room with wall-mounted dryer above washing machine. Traditional style large laundry room with custom built white cabinets, corner sink and stainless steel washer and dryer. Sleek white and dark gray modern laundry room with light wood flooring and lots of natural light. Huge long laundry room with built-in desk, long counter and plenty of cabinets on vinyl floor. White and black laundry room with washing machine and dryer tucked into mirror-faced closet. Mid-sized laundry room with rich red wood cabinery, white sink and red washing machine and dryer in a totally concealed separate laundry room space. Small dedicated laundry room with washing machine and dryer elevated on small platform for more convenient access. Craftsman cabinets fill this small laundry room with white laundry room appliances. Huge custom designed and built laundry room that is about as perfect as it gets with sink, elevated appliances, plenty of cabinets, lots of floor space to organize clothing and so much more. Non-cramped laundry room with wall-mounted cabinets, small counter and lots of floor space for organizing laundry workload. Separated laundry room with slate tile floor, dark wood cabinetry and light beige walls. Close-up photo of white and light green laundry room with lots of custom white cabinetry set against a light green wall. Stylish contemporary laundry room with white cabinets, black countertops and black washing machine and dryer. AWESOME FEATURES: Very well planned out laundry room with hamper system, elevated washer and dryer placed beneath wall0mounted cabinets and a fabulous clothes drying rack. Small but highly functional white laundry room with stainless steel appliances. Includes miniature sink. Spacious brand new laundry room in large home with white cabinets and stainless steel appliances on brown tile floor. All white narrow, long laundry room with plenty of storage space and a long rectangle sink next to the washing machine. In 2017 I started collecting interior design statistics and data for every room of the house. We’ve been analyzing hundreds of thousands of room designs, including laundry rooms in order to come up with useful statistics. We’re slowly adding our findings to all of our photo galleries and other articles. For laundry room design, we discovered the following, which I think you’ll find interesting. Dedicated laundry room: 54.6% of laundry rooms are in a dedicated space or room. Multi-use room: This means the laundry facility is in a room with other purposes such as a mudroom, kitchen or bathroom. We found that 40.28% of laundry facilities are in multi-use rooms. Closet laundry facilities: This, I think is the most interesting. 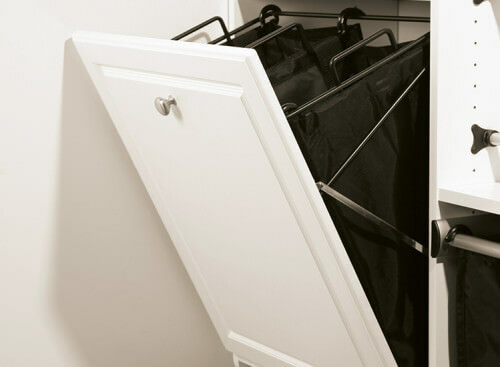 While closet laundry room facilities are cool and great for saving space, only 5.12% of them are in closets. Side-by-side: 81.16% of washer and dryer configurations are side-by-side. Ceramic tile: 29.86% of laundry rooms have ceramic tile flooring. This makes sense because ceramic tile handles water well and is easy to clean and keep clean. Porcelain tile: 24.95% of laundry rooms have porcelain tile flooring. Like ceramic tile, this makes sense for the same reasons. Hardwood is used in 18% of laundry rooms. It’s not the worst choice because hardwood these days can handle water and is easy to clean, but it’s more vulnerable to water damage than tile. Vinyl flooring is used in 4.78% of laundry rooms. Vinyl is very durable; it’s just not as nice as tile or hardwood. That said, we have vinyl flooring in our laundry room (which doubles as a mudroom) and we love it. You simply cannot damage it. Until recently, laundry rooms were an after-thought in home design. What a mistake. Can you believe that many homes actually intentionally were built with the laundry room in the basement while bedrooms were on the second floor. I grew up in such a house. Unless you love climbing stairs for no reason at all, it’s ludicrous. They need to placed near bedrooms. And then there’s utility – storage, counter space and incorporating all the laundry operations such as folding, ironing and getting out stains. Every laundry room, if possible, should have a folding station, hamper station, storage for cleaners and an ironing board. Most don’t. I don’t get it. Below are 16 brilliant laundry room ideas you should consider when planning and designing your laundry room. Where possible, we include a snazzy photo just to show you how great it can look. If you like these ideas (or you think the photo is amazing), share it. Built-in folding station in laundry room. Designed by Closet Factory. I admit it. Kenny Rogers’ “The Gambler” is on my Spotify playlist. I love that song. Can you believe the writer of that song had a hard time finding a singer to take on the song (he shopped it around for two years). Like the Gambler, you gotta know when (and where) to fold ’em and the answer is in your laundry room. Okay, I know not every house has space for a large laundry room. We all ain’t living in the Spelling Manor. But if you’re here, chances are you’re looking to redesign your laundry room and so I want to give you what I think are the best design ideas. Your step tracker won’t give the love, but trudging back and forth between distant laundry room and bedrooms is totally unnecessary. What’s the deal with laundry rooms buried in the far corners of the house? I don’t get it. Given how much laundry the average household does and the fact laundry is produced in the bedroom, it’s incomprehensible to me that laundry rooms aren’t built where the bedrooms are located (or at the very least on the same floor). If you’re renovating your home, seriously consider putting your laundry room near your bedrooms. Let’s continue the discussion about laundry rooms near bedrooms. If you have an existing laundry room and don’t want to repurpose that space, consider a second laundry room in a closet new the bedrooms. Granted, this isn’t our best laundry room idea, but it’s an option to cut down on running around your home. It’s costly to be sure given plumbing expenses and buying a new washer and dryer. But it just might be the best investment you make especially if your current laundry room is in the basement, garage or some far-off utility room in your home. Suggesting that your washer and dryer be side-by-side isn’t exactly an earth shattering idea. As you’ll see from our awesome laundry room photo gallery above, most are side-by-side. Here’s where the idea comes in. Actually it’s more of a laundry room design tip. I know how important this is because our laundry room screwed this up. When you configure your washer and dryer side-by-side, you want it so the front loader doors swing to the outside away from the adjacent appliance. This way you don’t have the doors blocking easy transfer of clothing from the washer to the dryer. Can you believe we got this wrong? It’s a real hassle. I like most of clothes air-dried. No matter what clothing labels say about pre-shrunk, I find every time I put my clothes in a dryer, they shrink. I have a pet peeve against short arm sleeves and pants. Our laundry room does not have a drying rack, but it sure would be nice. When my clothes get dried, we have racks all over the place. While it’s not the end of the world (first world problems), it sure would be nice to have a drop-down drying rack in the laundry room. My mother-in-law has one and it’s great. My mom had a drying room next to the laundry room (both of which were in the basement which wasn’t great, but at least the basement space permitted a large drying area with 7 lines strung across the space. My mom could dry several loads at once. Laundry rooms are utility spaces, much like a kitchen. Any utility room needs surface area to do stuff… stain removal, folding, storage. You can never have too much available surface area in a laundry room. While our laundry room is certainly not ideal in many ways, it did get the sink issue right in that it has one. In fact, it’s a pretty big and deep sink which is great for all the grime and dirt that enters the place. We even put our kids in there to wash feet and legs after their frequent stints to our backyard mud pit. 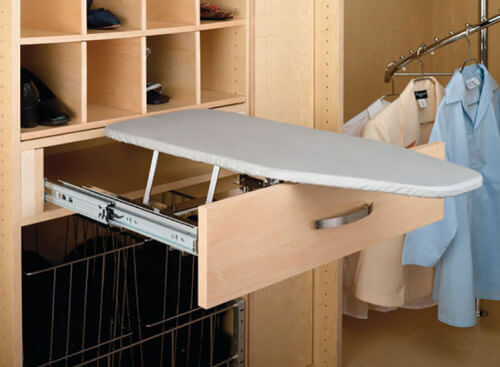 Slide-out ironing board in laundry room. Don’t you hate it when you think the wash is done so you head there only to see there’s 5 minutes left. Should you wait or should you come back? Well, why not add an ironing board into the space so you crank out a few crisply ironed shirts while you wait. Besides that, it just makes sense to consolidate all laundry operations into one space (washing, drying, folding and ironing). Ask any parent who does laundry if there are kids in the house and they’ll tell you they spend a lot of time in the laundry room. Probably more time than a formal living room and dining room. Yet, we invest all our fancy design dollars and efforts into some formal living and dining rooms and pay scant attention to the laundry room. I think you should invest in an attractive laundry room. Any room that you want to look good needs to have a window. Human beings must have natural light. It’s important so why not ensure the laundry space can accommodate a big window. If you have a dedicated laundry room, it’s not hard to add a cabinet with surface area. You can even add some upper cabinets for more storage. Storage in a laundry room helps big time. We have upper and lower cabinets and they’re fabulous for all the cleaners, paper towel and other items that come in handy in the laundry process. I’m not gonna say much here except when it comes to laundry room flooring, go for practical. Practical is durable and water resistant. The floor in a laundry room will take a beating; you need to get the right flooring material to handle that beating. Vinyl is a great option. Moreover, vinyl can look great these days and you’ll never have to worry about it getting ruined (unless your 8 year old decides taking an axe to it would be fun). Going practical doesn’t mean ugly. Check out many of the laundry rooms above; they’re beautiful. Incorporate your home’s interior design style into the space – whether modern, contemporary, traditional, cottage, rustic, Mediterranean, Midcentury, eclectic, shabby-chic… make it a design extension of your home. There’s no set size for a laundry room. 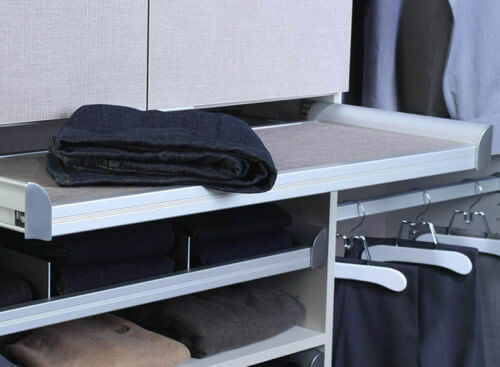 The can be as small as a closet or as large as a full room. I think if given a choice, especially if you have kids in the house, a dedicated room is best. I don’t have to tell you just how much laundry you do with kids. It’s insane; a never-ending manufacturing process of pumping out clean clothes. Part of this process entails mounds and mounds of dirty clothes followed by baskets and baskets of clean clothes. You never get caught up, but it sure is nice to have the space to manage it all. You no sooner get through all the clothing and then realize it’s time to wash the sheets and towels. Another two massive piles of clothes. When does it end? Never, or until you win the lottery and can hire it out. Check out our small laundry room design ideas here. As a utility space, you need to see. Don’t go for mood or ambient lighting in the laundry room. Get it lit up nicely (not annoyingly bright though). You need to be able to read small-print clothing labels, cleaner labels, look for stains… all sorts of activities where good light is necessary. We put TVs everywhere these days. If your laundry room has an ironing station and/or folding station, somebody is gonna spend some serious time in there. Why not drop an extra $300 for a small smart TV so you can watch the news or continue your latest Netflix binge? And no, sadly we don’t have a TV in our laundry room, but if we get around to renovating it, you can bet your bottom dollar I’d definitely want one in there. Some people like built-in hamper systems. I don’t. 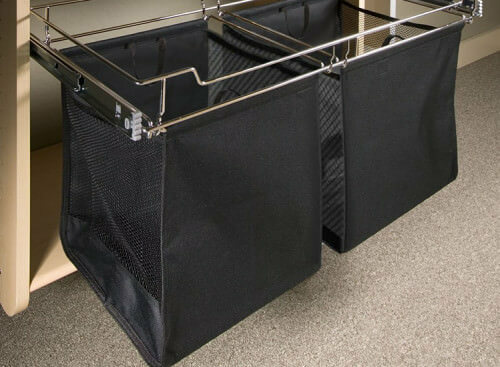 We have many lightweight hampers that are transported to and from the laundry room. It works well. 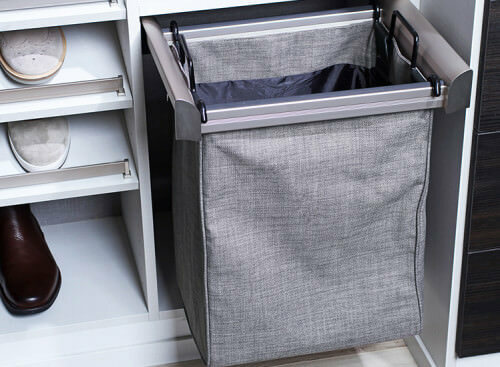 I think a dedicated hamper system is only good for households that don’t produce loads of laundry… although I can see the attractiveness of such a feature for running kitchen rags and other filthy items directly to the laundry room. Laundry rooms can be placed in a number of rooms in the house. While a dedicated laundry room is best, that’s not always feasible given space and/or budget constraints. The dedicated laundry room near bedrooms is best. The bigger, the better. It’s a high utility room that’s used daily and so why not make it fabulous and user-friendly. Here’s an example of an amazing laundry room that’s only a laundry room. 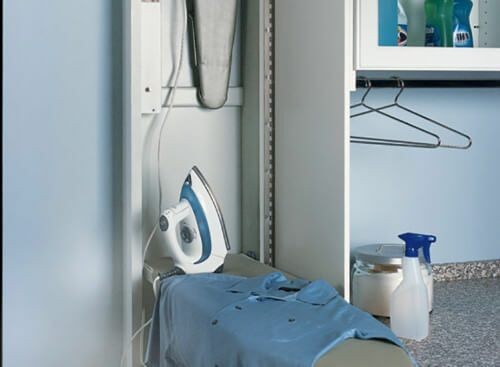 For smaller homes, the closet laundry room is ideal. What’s often great about the closet type is that it’s usually very close to bedrooms. So while it’s not large, it’s situated very conveniently. Other than the basement, I can’t think of a worse place for a laundry room. It’s cold, dirty and often far from the bedrooms. The only plus side is you can easily deposit filthy clothes in the garage sparing your home from dirt, water, mud, grease and all the other filth clothes attract. The mudroom/laundry room combo is very popular. One can argue it’s an efficient use of space, but it’s not ideal since it can be a dirty space and often ends up cramped. Mudrooms end up storing a ton of outdoor wear and gear leaving too little space for laundry. Some smaller homes, especially in Europe, place the washer/dryer in a bathroom. It’s not a terrible thought given it’s usually close to the bedrooms and clothes are removed in bathrooms. The downside is that unless it’s a huge bathroom, the laundry space is very small. Again, smaller homes sometimes (not often) place a washer/dryer in the kitchen. Frankly, it’s an odd location. It’s not convenient and who wants dirty clothes where food is prepared? That said, it can be efficient for very small homes (i.e. tiny apartments). Many older homes have the laundry room in the basement. Talk about terribly inconvenient forcing the launderer to hoof it up and down one or even two sets of stairs loaded down with clothes. The plus side, if there is such a thing, is that often there’s a decent amount of space in which to operate. An exception to this being terrible is if your home has a laundry chute. This can be convenient for getting clothes to the laundry room, but it doesn’t help with clean clothes delivery. For laundry room flooring you want durable and water proof. You want to be able to dump dirty, wet, muddy clothes on the floor and not worry about it. Vinyl and linoleum are idea. Tile isn’t bad, but not quite as durable as vinyl or linoleum. Vinyl is an excellent, cost-effective and durable flooring option for laundry rooms. These days you can get attractive looking vinyl so you don’t have to forego aesthetics with vinyl. While some options are durable, it can be expensive and frankly laminate isn’t very pretty. It has a faux look unless you spend some serious money which isn’t really necessary for a laundry room. While it looks great, hardwood isn’t great for laundry rooms because the floor will get wet frequently. Not a terrible option, but I personally don’t care for tile unless in a hot climate. The plus side is it can look fabulous. Rugs and mats are perfect for laundry rooms since they offer some protection to the floor as well as a warmer surface option. As much fun as I had coming up with this list and photos showcasing smart laundry room design ideas, it’s time to wrap it up. There’s more you could consider, but in my mind these are the biggies. The key point is if you’re fortunate enough to design a laundry room from scratch or renovate one, put some thought into. It’s a high-use space where smart design can definitely improve your life.